ENV is the quintessential DDC Control system. It Monitors and Controls all aspects of a complex HVAC installation. If you think of all of the mechanical devices in a building as the musicians, the occupants as the audience, then ENV is the Conductor. Please watch this short video. It tells the whole story. It was developed by Rehau, a reseller, who markets ENV under a private label as RSC – Rehau Smart Control. The question you should ask yourself is "Do any of my upcoming projects require a sophisticated DDC control system?" Look over this list. If at least one of those projects requires 3 or 4 of these, then you should consider ENV. From the simplest to the most complex combination of HVAC hardware and Sequence of Operations (SOO), ENV can manage it all without any proprietary programming. The I/O Points and the Sequence of Operations (SOO) are defined in tables using a click and point web interface. Climate Automation Systems offers a service to create these tables; but the mechanical contractor can do it as well. And the end user can easily create Macros and setup Virtual Thermostats, or even create data monitors to track performance. Next stop, Voice Commands. All functionality in ENV is implemented via a Web Interface with access from any device including Smartphones, tablets, and Microsoft Windows or MAC PCs. There is also an ENV App available for Apple and Android devices. Combined with automatic alerts, the service company can typically determine the source of a problem over the internet before making an onsite visit. And the user can alter their thermostat settings while on vacation in Hawaii. Functionally, a Control Device is similar to the “box on the wall” that is normally used to control one specific function, like a set point controller. ENV includes over 23 Virtual Control Devices. They are prepackaged routines that can be selected to perform a multitude of tasks, some simple but most complex. For example, staging three (3) heat pumps to manage the radiant buffer tanks in a least used rotation based on the trend analysis of the real time load required. Just choose the appropriate Control Device, select the input and output points, and specify any required parameters. ENV the "Conductor" will take it from there. 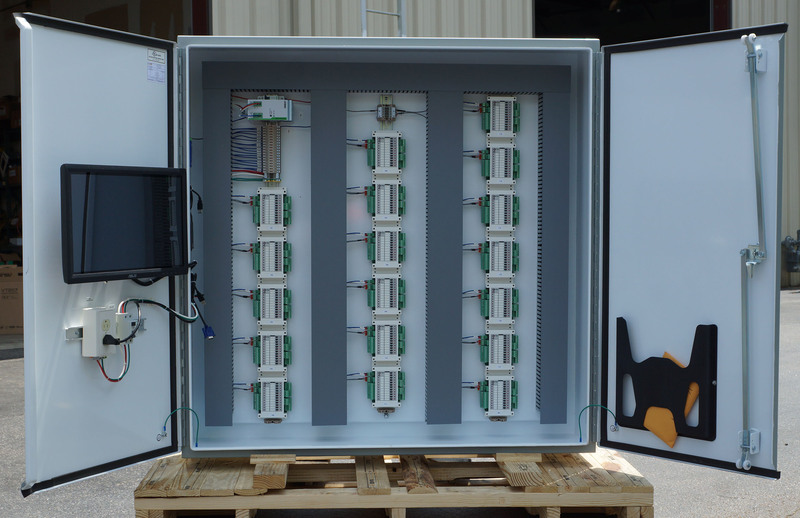 ENV’s advanced SIM controller is capable of managing a single snow melt zone or an unlimited number of zones each with a specific priority (1-10) and mixing strategy. One of the truly energy saving features is its ability to harvest the heat in the snowmelt zones, when not in snowmelt mode, to use internally for heating radiant floors and domestic hot water. SIM automatically sets an Idle temperature proportional to the forecasted probability of snow. SIM also manages priority zones based on the real time analysis of the snow melt load requirement and the boiler capacity at the time. And excess boiler capacity can be used to heat domestic hot water based on priority settings. Commissioning couldn't be simpler by use of the ENV Toolkit. 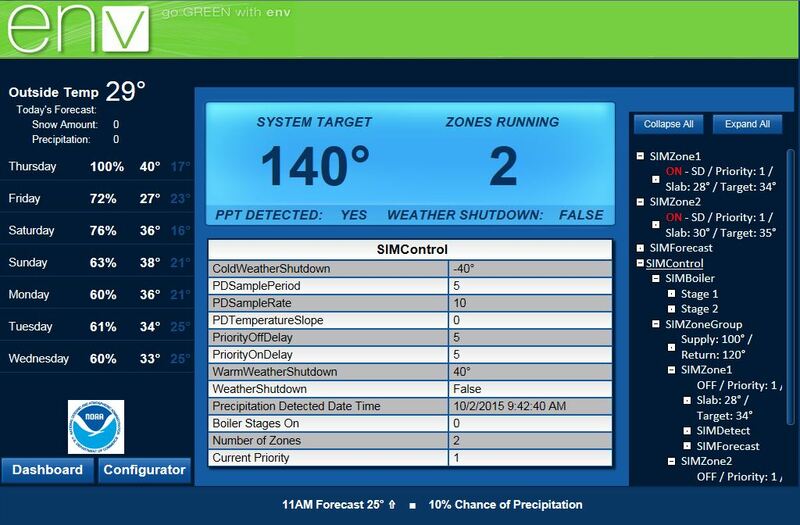 Using a combination of the real time Visualizer, the ENV Simulator, and Data Monitors, the sequence of operations defined in the ENV database can be verified long before all of the equipment is actually installed. Also, ENV allows the contractor to engage subsystems one at a time until all the mechanical systems have been integrated and certified. And no mechanical contractor should be on site without his tools. By using a very robust database, SQL Server, ENV can store massive amounts of data in real time. This data can be reviewed via trend charts, real time graphic monitors, EXCEL spreadsheets, and animated graphical Visualizers. These representations of the data are instantly available with one click of a button. There are no complex methods required to extract this information. Press a button and view a chart, it’s that easy! You may discover gold. The trend today in high end homes is to minimize wall clutter by eliminating the thermostat. ENV makes that possible via a Virtual Thermostat. Temperature sensors hidden in the sheetrock can be used to monitor room conditions. Setpoint and mode changes can be made from either a Smartphone device or any Internet browser. Slab sensors can be added in each zone so that ENV can balance the effects of both radiant and ambient temperature (MRT) on occupant comfort. A single temperature sensor can be used for both a radiant and a forced air zone. Real and virtual thermostats can be combined in a home as required. By using NOAA or Environment Canada, ENV obtains the temperature forecast for the next 3-6 hours. By combining the forecasts with the current outdoor temperature, the outdoor reset curve is adjusted to compensate for a rapid increase or decrease of current conditions. 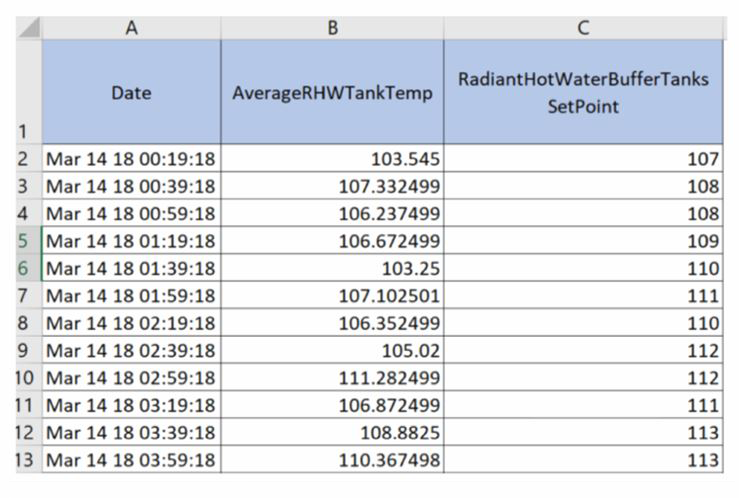 Because of the extended time it takes to ramp the slab up or down, the water temperature to the hydronic zones is increased or decreased proportional to, and ahead of, the forecasted temperature. The occupants are comfortable, the slab remains at the proper temperature, over-shoot is avoided, and less energy is expended. It doesn’t get better than that. Macros can be used to instantaneously alter conditions in the home or building. For example, changing a set point or mode, shutting down a heat pump, turning on Vacation Mode, start or stop heating domestic hot water tank, etc. There are three ways Macros can be executed: 1) via a click by the user from their browser or Smartphone, or 2) by using a predefined schedule, i.e., every morning at 6AM, or 3) based on a true or false condition, i.e., the temperature outside has dropped near freezing and the heat pump is inactive. 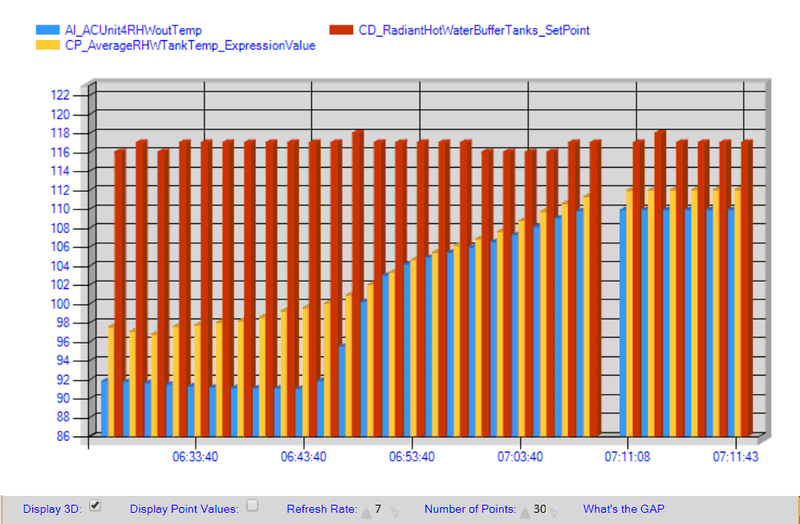 Wouldn’t you want to know when an operational problem is occurring and how critical it is? Alerts can be established based not only on a single event but on a complex set of conditions, i.e., heat pump should have turned on but it didn’t after 2 minutes. Alerts will reduce the time to restitution and minimize expenses for the home owner. They are sent as text or email messages to the interested parties and there is no limit to the number and type of Alerts. Our server constantly monitors all of the ENV installations across North America via a handshake heartbeat. Power outages in a remote location during freezing conditions can be catastrophic. If a power outage occurs, an email or text message will automatically be sent from our server to all interested parties. Other possible alert conditions include communication failures, nightly backup failures, excessive critical errors, notification of new product releases, etc. 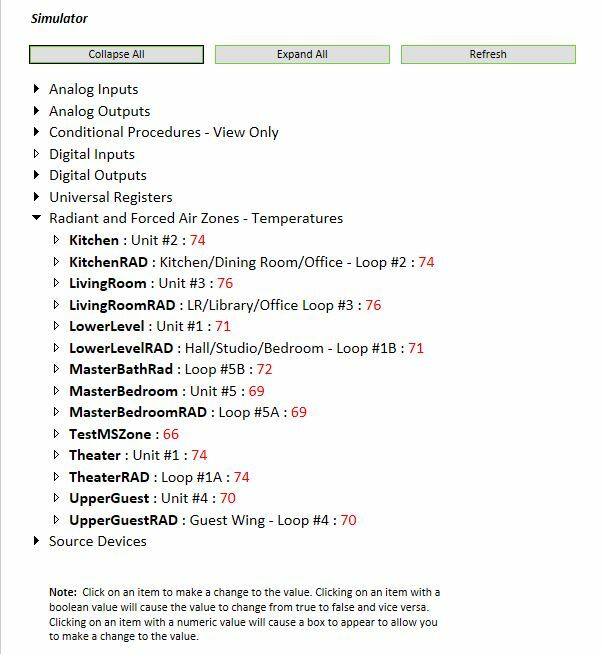 The user has the ability to create a custom dashboard that allows him to manage all of his zones and other HVAC functions with a single click of a mouse. ENV supports devices that communicate using BACNet, Modbus, or ASCII. These account for virtually all communication protocols for most devices found in a home, building, or mechanical room. The mechanical contractor is free to choose devices they prefer to use at the right cost for the customer. 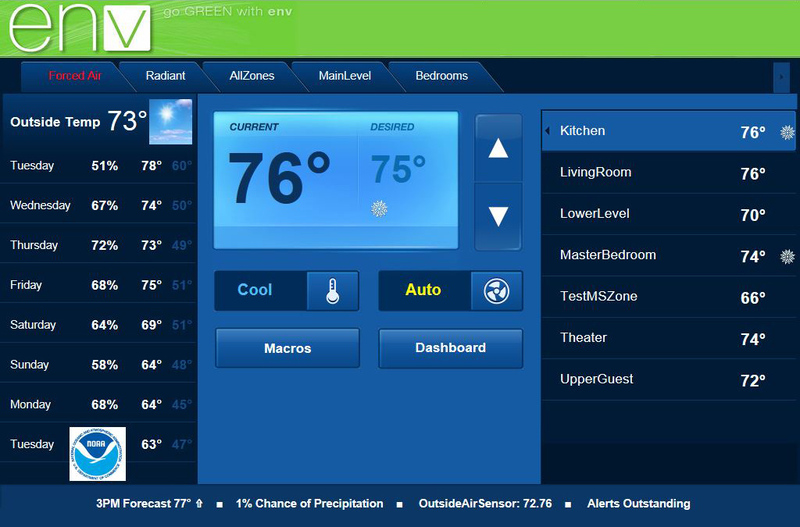 ENV provides an open interface for any Home Automation System (HAS). This expands the user’s access to the various ENV facilities from not only a browser device but also the HAS devices. The benefit of Virtual Thermostats still applies since ENV controls and interfaces to all hardware, not the HAS. Climate Automation Systems brings decades of experience in the world of Software Development of mission critical applications. By partnering with the home owner’s team, we will not only go beyond satisfying the requirement but also deliver functionality that will save the home owner money, maintain their comfort, protect the environment, save time and increase your profits, and put you heads and shoulders above your competition. ENV is simple to install and place into operation. Of course many companies make this type of claim; but here are the simple facts. Provide us a) a Points list, b) the Sequence of Operations (SOO), and c) a mechanical schematic. We'll develop the tables that implements the sequence of operations. And we’ll also build the custom interface cabinet which also contains the ENV operational PC. You hang it on the wall, connect power, attach an Ethernet cable, and homerun ALL field wires to the cabinet. Assuming the mechanical systems are in operation, we are now ready to commission. The cabinets are fabricated in a U/L and C/L certified shop. It is totally self-contained and fully assembled, and includes the ENV server computer, Ethernet connections to the Internet, and the input/output I/O blocks used to communicate with all points and devices. It is sized based on the number of I/O points. The wires for all devices and points terminate in the cabinet. No other intervening controllers are necessary. The cabinet is the gateway between the ENV server computer and all the devices being monitored and controlled. Each I/O block recognizes Analog and Digital inputs, or produces Analog and Digital Outputs. Inputs can be resistance devices like Thermistors, 0-5, 0-3.3, or 0-10 VAC, or even digital pulses generated by KWH meters and water flow devices. Analog Outputs can be 0-5, 0-10 VAC or 4-20 ma for modulating devices, or Digital dry contact for on/off devices. Users can access ENV via any standard browser or execute voice commands from Amazon’s Echo platform. 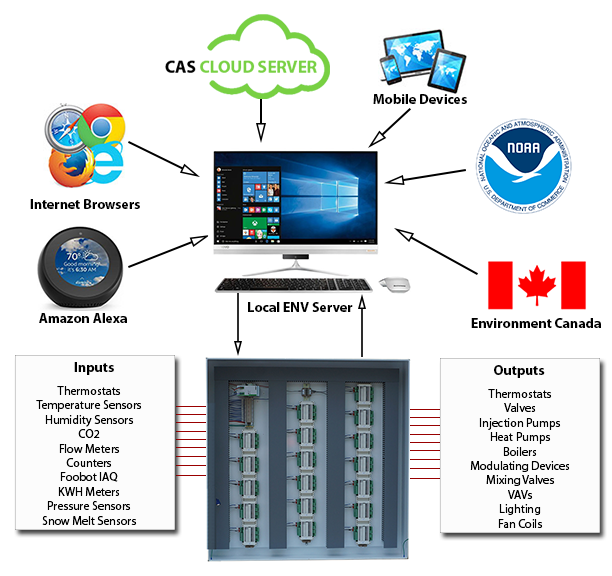 The CAS cloud server poles each customer’s local ENV server on a regular basis looking for critical error conditions. If total power outages are detected at the site, the User is alerted by the ENV cloud server via text and email messages. Visualizer Dashboard - The Visualizer is a very powerful tool that can be used to create dynamic Dashboard canvasses. Decorated Tiles can be placed on the canvas by the User with drag and drop mouse operations. They represent objects updated in real time, including zones and zone status, database values, indoor air quality values, KWH usage, graphical monitors, and Macros, and page links to other canvasses. The User can create multiple Dashboards and link to them from other canvasses. Mode, setpoint, and fan speed, can be altered by clicking on a Zone tile. Animation - By combining a background images, like schematics, with icons in the Visualizer's assortment of icon elements, the User can monitor the real-time operation of every component in the mechanical plant. Based on real-time conditions, icons can be automated to slide, rotate, expand and contract, etc. For example, if a radiant zone calls for heat, all the associated pump icons could be programmed to rotate. Data Mining - Using a very robust SQL Server database, ENV can selectively store massive amounts of data in real time based on sampling rates and retention period. This data can be reviewed via trend charts, real time graphic monitors, EXCEL spreadsheets, and animated graphical Visualizers as described above. These representations of the data are instantly available with one click of a button. There are no complex methods required to extract this information. Press a button and view a chart, it’s that easy! The Simulator – used to manually alter input values in order to see what that change has on the sequence of operations. For example, if the temperature in the Master Bedroom goes below the set point, the fan coil might go on, a pump might cycle on, and the boiler may fire in order to heat the water. However, if the solar panels can produce sufficient hot water, the solar pump will go on, various valve will rotate, and the boiler will remain dormant. You can “see” those outputs change without actually engaging the physical devices during simulation. "The ENV Snow and Ice Melt System (SIM) takes advantage of all of the unique functionality of ENV and delivers a capability for snow and ice melt not found in any other hardware implementation." SIM can manage an unlimited number of zones each with a unique priority. Each zone or zone group can have a unique mixing strategy. Zones can share snow sensors or each zone can have its own sensor. Speaking of total control by ENV, the heat of the water in the snow melt zones when not melting snow, can be harvested and used much like a solar panel to supply heat for fan coils, radiant heat zones, or DHW. Isn’t that a unique idea? When in full melt operation, SIM monitors the trend of the delta-t between the supply and return water temperatures of the boiler plant system. If it is determined that the boiler (s) can’t keep up, i.e., the trend is pointing south, the low priority zones are disabled. Once that condition changes, those zones are put back into service. Thermodynamically, it takes less energy to keep a slab free of snow if the slab is preheated (Idled) than to start the melt cycle when the snow arrives. That’s why most snowmelt systems provide a mechanism to start the Idle cycle. However, they require manual intervention by the user. SIM does this automatically without user intervention! By using the NOAA and Canadian Weather snow forecast report, SIM computes the probability of snow in the next 3-6 hours. The Idle temperature computed by SIM is in direct correlation to that probability. The higher the probability the higher the Idle temperature. Because of the total integration of all devices under the control of ENV the "Conductor" the SIM boiler plant can also be used to heat domestic hot water when there is enough excess energy to do so. Or, DHW can be the priority. Imagine rooms without thermostats. What would you think about temperature sensors buried in the sheetrock - out of sight. Or maybe a few thermostats hidden in closets in guest bedrooms. And instead of two thermostats, imagine a single thermostat or wall sensor in the living room for both forced air and radiant, each with separate control requirements? Should Thermal Comfort be a function of just an ambient temperature sensor or should it be combined with a slab and humidity sensor? For floor warming a slab sensor is required. ENV can handle any combination of sensors and thermostats to maintain perfect Thermal Comfort and reduce energy consumption throughout the home or building, zone by zone. Try managing a Health Care facility with 120 rooms and public spaces without a single thermostat. It was no problem for ENV. And of course the user has access to every zone via an ENV Smartphone or Tablet App, or by using a web browser.